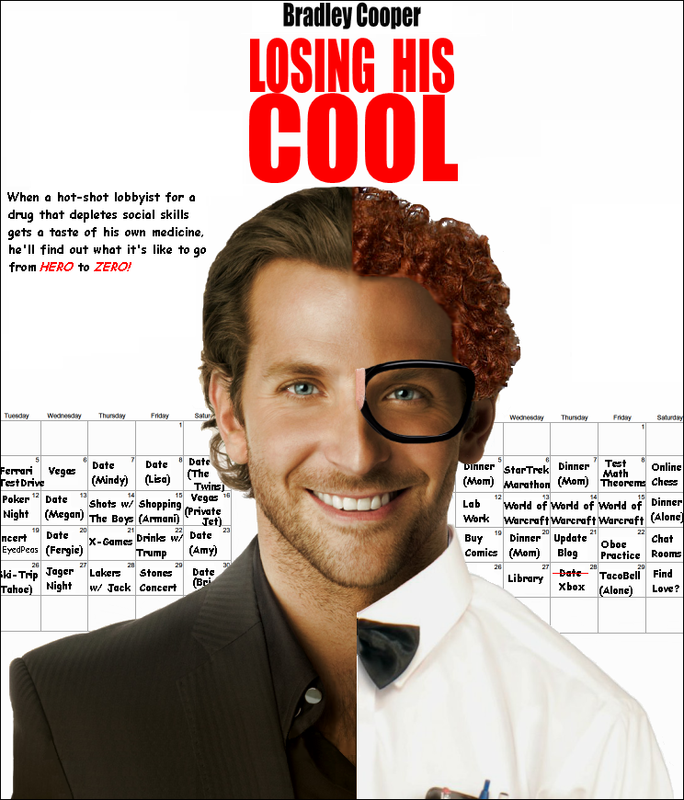 Blake Miller (Bradley Cooper) is a hot-shot, lady-killer Washington D.C. lobbyist who’s a winner in every aspect of life. His career couldn’t be hotter: The drug company that Blake lobbies for, Pilzer Pharmaceuticals, produces a pill (called Awkwardim) that depletes a person of all their social skills. Blake is on the verge of a deal with the US Government to invest a billion dollars in Pilzer with the purpose of delivering Awkwardim pills to enemy spies so that they no longer have the cool and savvy to get themselves out of tough situations. Blake continually wins the spotlight of the entire industry and the approval of his hard-nosed boss Ed Forester (Alec Baldwin), much to the chagrin of fellow Pilzer lobbyist Peter Hinch (Topher Grace) who has played second fiddle to Blake his entire career. In his love life, Blake also can’t seem to fail: Every night he beds a new gorgeous conquest that he smoothly kicks to the curb the next morning. Models, movie stars, and heiresses; it seems no one is immune to Blake’s charm. Or, as it turns out, ALMOST no one. Emma Hart (Mila Kunis) is the chemist at Pilzer Pharmaceuticals who first developed Awkwardim in the hopes of robbing foreign war criminals of their confidence and bravado, thereby leaving them unable to lead. Despite Blake’s many attempts to win a date with Emma she always turns him down, citing Blake’s ego, cockiness, and selfishness as deal-breakers. On the night of the D.C. Lobbyist awards, the entire industry is present as Blake is awarded Lobbyist of the Year. While he watches an exuberant (and drunk) Blake charm the crowd during his acceptance speech, Peter Hinch decides he can no longer take settling for second place. Making up his mind on the spot, he slips an Awkwardim pill into Blake’s champagne glass, which is quickly downed once Blake returns to his table. The next morning, Blake wakes up hungover, looks in the mirror and is shocked to discover that his vision is blurry, his face is full of acne, and his hair has inexplicably started turning red! Blake immediately heads to the Doctor’s office where he comes in contact with the Doctor’s attractive but crazy receptionist Amy (Isla Fisher) who Blake had a fling with a few months prior. As Blake tries to talk his way into an angry Amy’s good graces he realizes that he has no idea what to say to her. No matter how much he awkwardly scrambles, the smooth words that usually come so easily to him are nowhere to be found. Over the next week Blake continues to become more and more awkward, both physically and socially. Knowing his billion-dollar deal with the US Government is due to close in 2 weeks, Blake must hide his ever-worsening “condition” so that everything goes off without a hitch. It’s during this time that of desperation that Blake, realizing he’s been doused with Awkwardim, goes to the only person he knows may be able to help him: Emma Hart, the drug’s creator. Reluctant to help at first, Emma can’t help but be drawn to Blake’s nervousness and shyness. She’s further amused by the usually smooth Blake having such trouble navigating his former life-style. And while there is an undeniable spark between the two, Emma has recently started dating Peter Hinch who has seen his career take off ever since Blake’s troubles began. As a result, it’s up to Blake to accept himself as an insecure guy who doesn’t have all the answers so that he can complete the big deal, overcome the attempts of sabotage from his rival, and win the girl of his dreams. What follows is a hilarious romp that explores what happens when we’re forced to shed the outer shell we present to the world and reveal who we truly are. Laugh along with Blake’s hi-jinks and awkward adventures and cheer for his emotional redemption as he seeks to win at life while “Losing His Cool”!